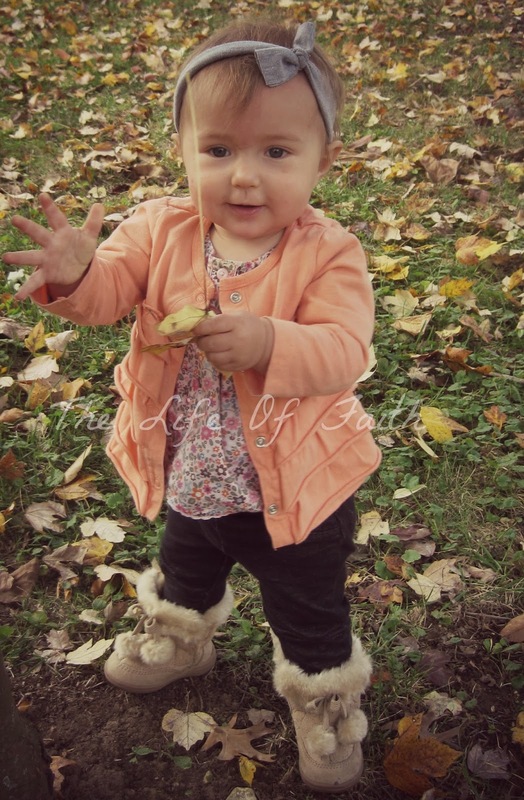 The Life Of Faith: Sweet Pea is 11 months old! Eleven months sounds so old! Sweet Pea, this is your last update before you are 1 years old. Even as I type it, I can't believe it! 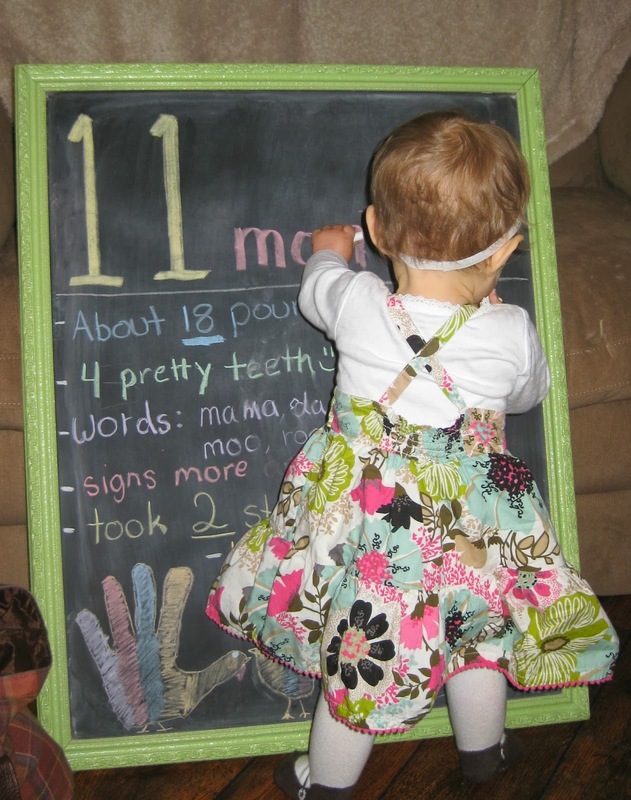 This was the first month I let you draw all over your chalkboard. You have a new found love for drawing with anything and on anything. This mama's in trouble! Size: I think you only weigh about 18 pounds which is pretty tiny for your age. Yes, you can blame your mom and dad for that. We are little people! You are still wearing your 9 month clothes but starting to fit into some 12 month outfits. That's a good thing, especially since all of your warm clothes are 12 month! You are wearing a size 3 shoe now. Milestones: You have become quite the talker! When you are at home you babble all day long it seems. Your voice is one of the sweetest things I've ever heard. Here's a list of the words you have learned so far: mama, dada, bye, woof woof, meow, roar, moo, tree, The cutest thing every is when we wink at you and you "wink" back! You try so hard but both of your eyes end up closing. It's so stinking cute! You started using your first signs this month and can sign more and all done! I'm so proud of you! You have also become much better at communicating what you need and understanding what we are saying! You know where your hair, hands, feet nose, eyes and mouth are. It's cute when you find a comb or brush to watch you brushing your hair! This month you have become much more confident in standing by yourself. It makes me sad to see you growing up so fast! Month 10 was the month of laughing. You have always laughed a lot but this month you just kept laughing at EVERYTHING! We would look at you and smile and you would give us a little giggle. It is adorable. I hope you never lose that happy spirit! You also became very artistic this month. 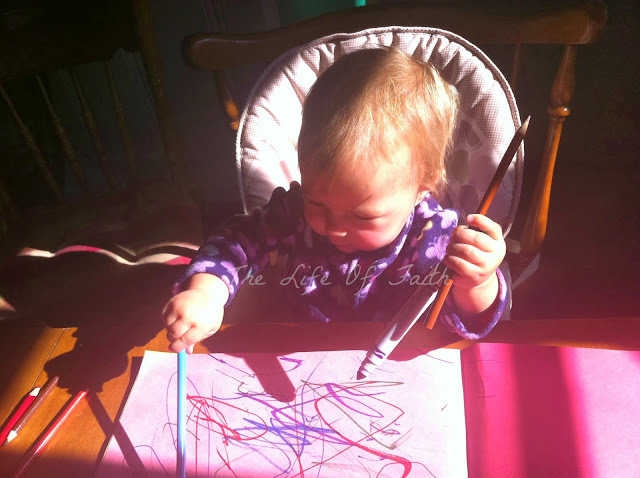 You love coloring on anything you can whether it's the fridge, chalkboard paper, or my cupboards! 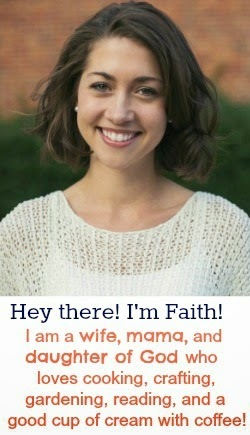 You learned how to give noggins this month as well! You think it's the funniest thing ever! Eating: I still breastfeed you 4x a day and 1x at night. You have 3 meals a day and 2 snack times! You have definitely decided you prefer fruit over veggies which has become a challenge for me! I try mixing it with fruit and different ways of tricking you. 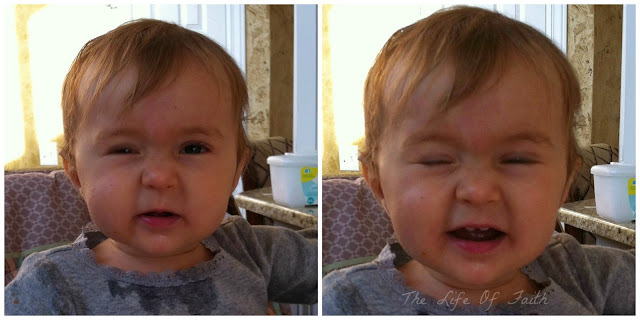 Your personality during mealtime is just hilarious. We are always laughing at you at the dinner table! Just a few weeks ago, I peeled a honey crisp apple and gave it to you thinking you would just nibble on it here and there and it would help soothe your swollen gums. Well not 15 minutes later the apple was gone. And I mean GONE! You were down to the core and I think you would have eaten that too if I didn't take it away from you! I have had a lot of fun coming up with creative healthy foods for you to eat. I wrote a post on Sweet Pea's baby food menu here. Sleeping: You take 3 naps a day and we've discovered that if we are consistent with that, you sleep a lot better at night! You still get up a couple of times and once to eat, but it's a lot better than it has been! Bedtime: 8:00 PM Morning: 6:00 AM Playtime: You definitely prefer playing with people over your toys. You LOVE it when your cousin Madison comes over to play. The two of you need your own YouTube channel and someone to follow you around with a video camera. It's that cute! You love stuffed animals and dolls. You play with them, cuddle them, rock them, push them in a play stroller and give them sweet kisses. Of course this wouldn't be a sweet pea update without one of your classic dance routines. Oh they are the best! 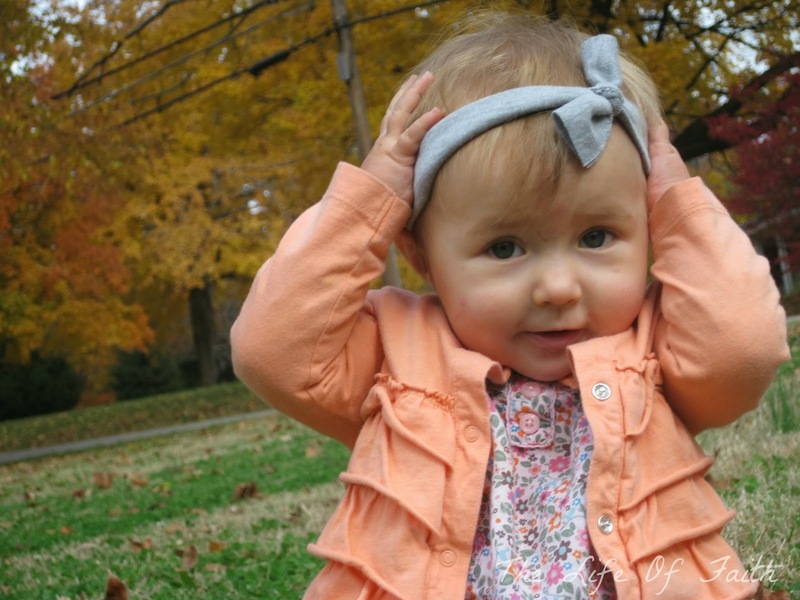 You just started "covering" your eyes with your hands to play peek a boo. Sometimes you end up with your hands on your head instead but you still think it's a fun game and I think you're adorable! You had a lot of fun splashing in the puddles when it rained! 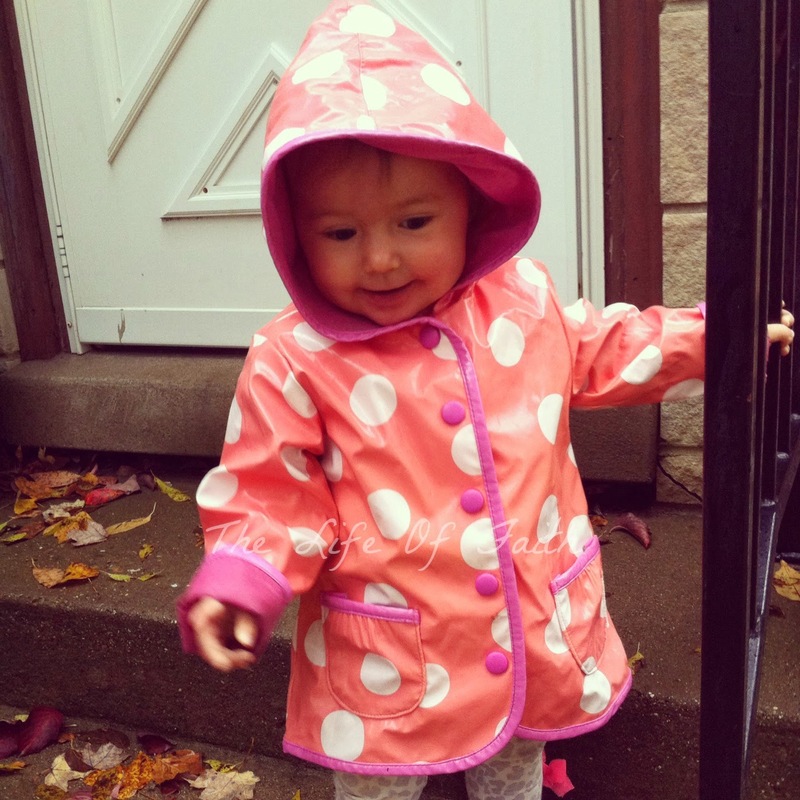 I, of course, loved the opportunity to put you in your super cute raincoat. I wish I had one! 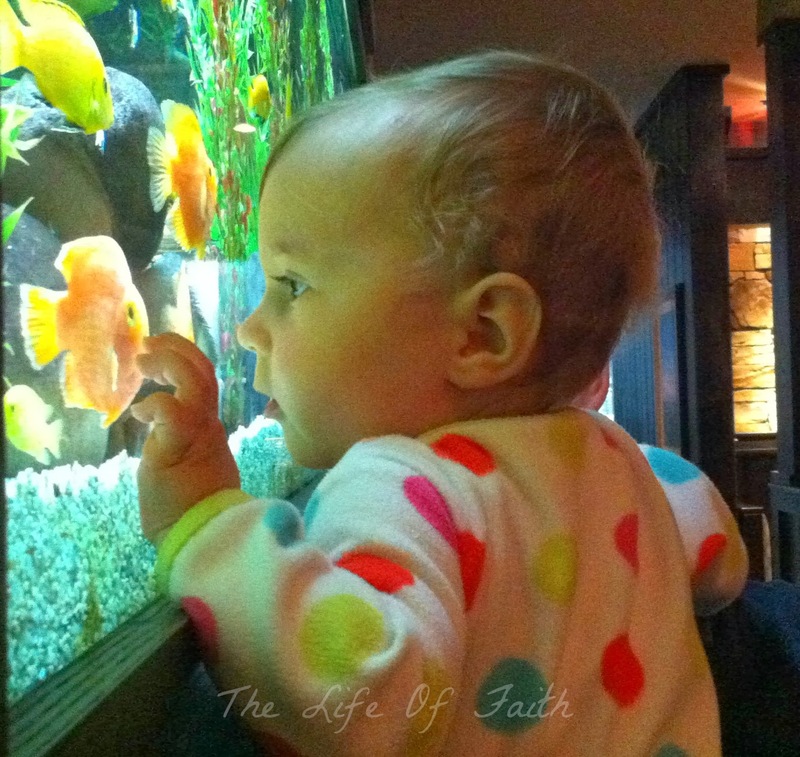 He took you to see these fish the other night and you absolutely loved it! Well that's all for now! Here's Sweet Pea's video saying goodbye and blowing you all kisses. Next time we update it will be for a one year birthday bash! Love love love her! Such a big month for this precious girl! She is such a cutie! 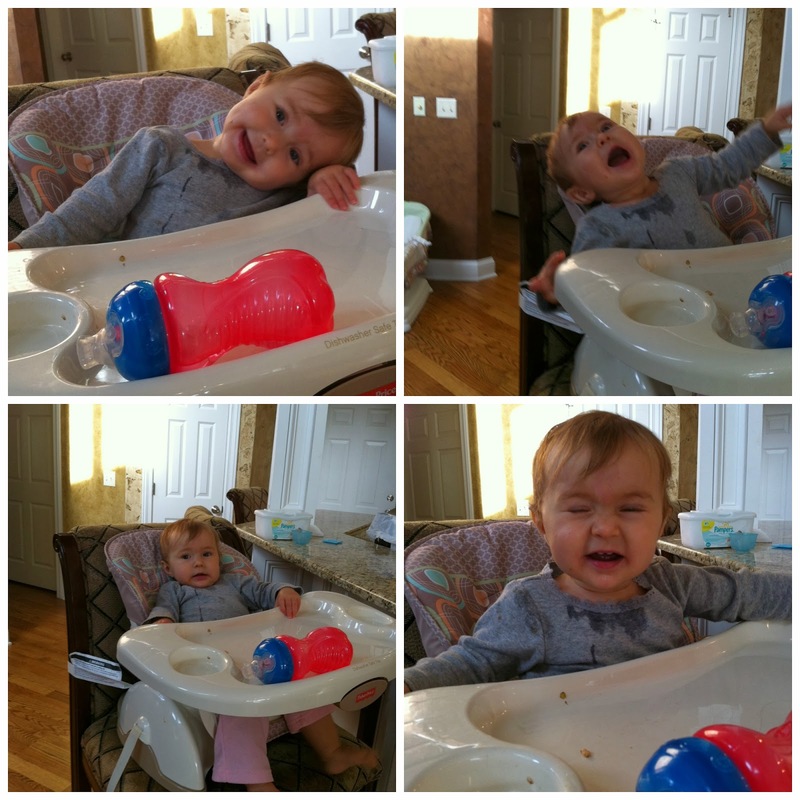 I love how much fun she has in her highchair. The time goes way too fast though, doesn't it? My little one will be 2 in less than 2 weeks. I have no idea where the time has gone. Oh, she is adorable. My little guy am was 18 at 1 year so I know how it is to have teeny tiny kids! What a lovely way to celebrate her accomplishments! 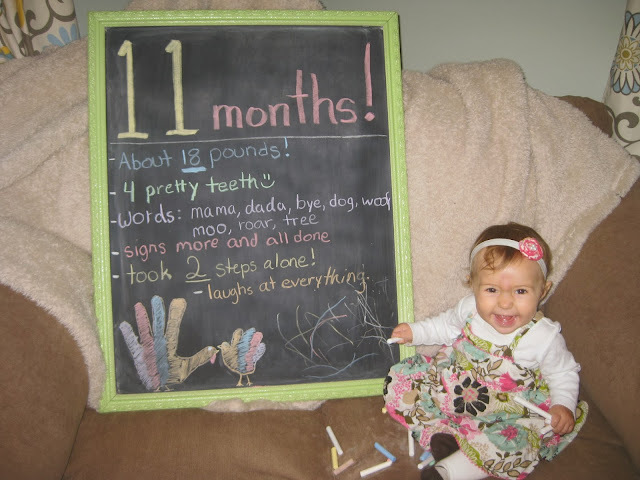 I have pinned this to my "Parenting" Pinterest board as an example of a great way to show kids' milestones. Cute and adorable! She seems to be a budding artist! 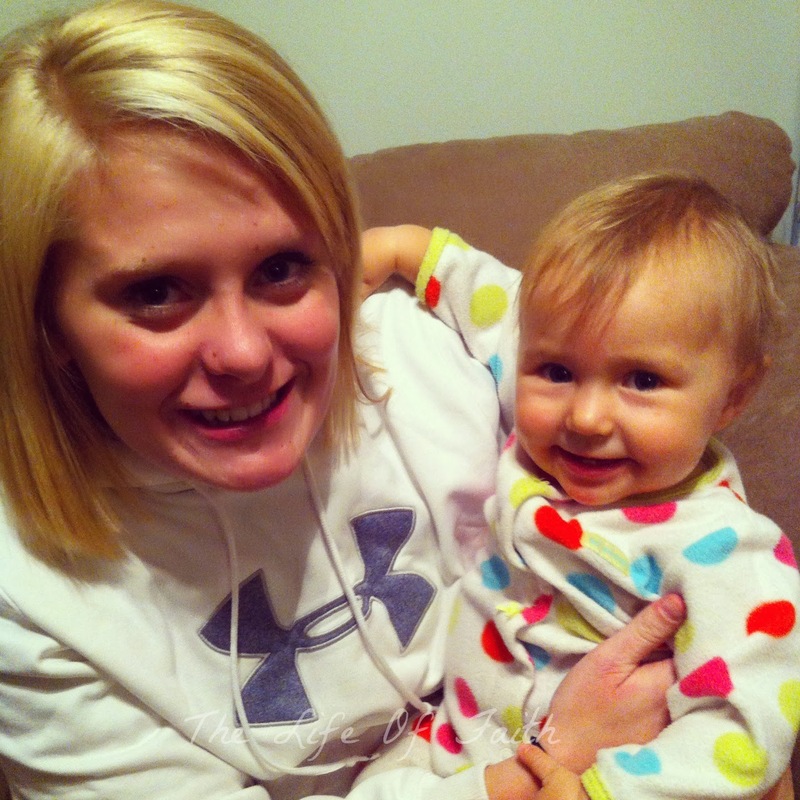 :) I wish her a very happy 1st birthday when it comes around.